For 1974-75, O-Pee-Chee made two separate sets. One featured NHL players, while the WHA players were given a set all to themselves. It was the beginning of a four-year run where the two leagues were split into different sets. At the same time, the NHL expanded and first-year cards of the Washington Capitals and Kansas City Scouts were included. The set size for 1974-75 O-Pee-Chee Hockey was increased to 396 cards. The first 264 are the same as what was offered by Topps. 1974-75 O-Pee-Chee Hockey card fronts feature a player photo that is either a posed shot or a game-action image. A graphic hockey stick runs along the left edge, with a team logo appearing in the lower left corner. A white strip extending from the stick gives the team name, and the player's name is included in a colored strip below that. A white border surrounds the card. The backs are oriented vertically, with a circle in the top left containing the card number and an orange-brown box giving the player's name, team, position and vital stats. A short biography follows in both English and French, and then the players previous season statistics and lifetime total. A cartoon about the player appears at the bottom, inside an oval-shaped area that looks like a puck. The first six cards in 1974-75 O-Pee-Chee Hockey feature league leaders in several categories from the previous season. Cards 209 through 215 recap the postseason series. All-Star players are credited with a box near the top of their base cards. Team leader cards feature pictures of leaders in several categories, and team photo cards feature a checklist back. Coaches show up for the first time since OPC began making their own cards. Cards 243 through 252 show the winners of the various trophies, and three checklist cards are included. 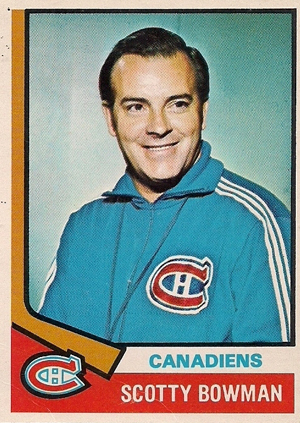 Among the notable coaches are Don Cherry and Scotty Bowman, who both appear on their first cards. Other rookies in 1974-75 O-Pee-Chee Hockey include Bill Clement, John Davidson, Bob Gainey, Lanny McDonald, Rick Middleton, Dennis Potvin, Gelnn "Chico" Resch, Steve Shutt and Borje Salming.